Why is Cataloochee a great place to go in the Smokies? - it's peaceful! It seems like the air in this pleasant, quiet valley just seems to say "relax." I didn't find it to be crowded at all. Many times we were all alone. - it has great hiking! This is home to one of my favorite hikes in the Great Smoky Mountains National Park. Check below to find out why! - it's historic! There are so many historic buildings and homes to see. Plus, they're easy to get to. Look below to find out about one of the most historic trails in the Smokies! - great camping! Cataloochee campground is one of the best you'll find inside the park. Check out my campgrounds link for more info. This is one of my favorite hikes in the Great Smoky Mountains National Park. It's a rare chance to hike along the boundary of the park and see some awesome views of the valley, while not straining too much in the process. Give yourself plenty of time to enjoy all this hike has to offer, like the valley views and a stop for lunch at Hemphill Bald. I recommend wearing long pants since there's lots of long grass. Bring a hiking stick too. That way you can check the ground before you walk on it. Snakes could be lurking among the tall grasses! When we hiked these trails, we started at the trailhead for Hemphill Bald Trail at Polls Gap. 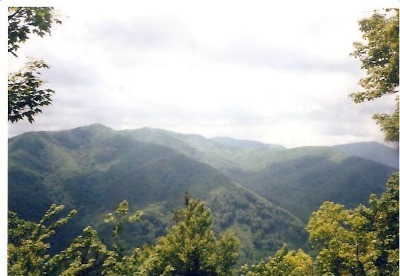 You'll hike 4.7 miles until you reach the summit of Hemphill Bald. The elevation at the bald is 5,540 feet. I know you're wondering what a bald is and how they came to be. Well, it's not agreed upon by all, but the general consensus is that these flat, open fields on mountains called "balds" came about by cattle grazing. 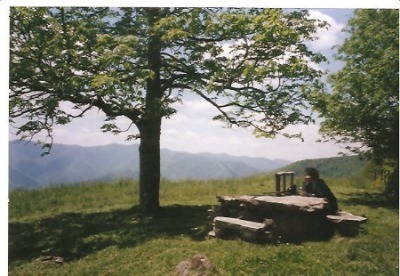 What's neat about Hemphill Bald is there's a stone table under a tree just perfect for stopping for a picnic. At 5.5 miles, Hemphill Bald Trail meets Cataloochee Divide Trail at Double Gap. At this point, you've got 6.4 more miles until you get to the end at Cove Creek Gap. There are lots of great valley views along this trail. You'll also pass by the Swag, which is a private resort. Keep in mind, you don't have to hike the entire thing. You could go as far as Hemphill Bald and turn back. That would make your total hike 11 miles. You wouldn't have to arrange for 2 cars or have someone pick you up either. But if you can work it out to hike the two trails, end to end, I highly recommend it. Approximate Elevation: Starts at 5100'. Hemphill Bald is at 5500'. Trail descends to 5100' at Cataloochee Divide junction. Trail descends then peaks at 5000'. Trails ends at 4100' at NC 264 junction. How to get to the trail: From the Blue Ridge Parkway, follow signs toward Balsam Mountain campground. Park at Polls Gap. Another great hiking trail you'll find here is the Little Cataloochee Trail. If you're staying at the campground, you can reach the trailhead from your campsite. You'll find so much history in this hike! I encourage you to take the time to explore all the sites and imagine what it would be like to live here in the 1800's. You start off with Beech Grove School. It's near the beginning of Pretty Hollow Gap Trail. What's neat is you can go inside and look around. The bad part is you'll find lots of graffiti. Once you start hiking on Little Cataloochee Trail, you'll reach another historic site. At 2.5 miles, you'll come to Daniel Cook's cabin. 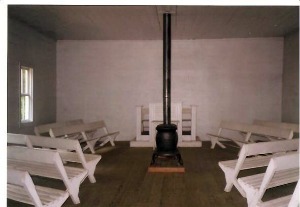 It was built in the late 1850's- early 1860's and restored in 1999. You'll also see the ruins of an apple house across from Cook cabin. At 3.2 miles, you'll come to Little Cataloochee Baptist Church. It was built in 1889. You're able take a look around inside. What stuck out to me was the noose hanging from the ceiling. Makes me wonder if they really did do their hangings in the church. If you continue another 0.8 miles, you'll reach another cabin. 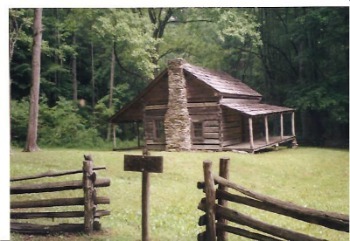 Hannah Cabin was built in 1864 and restored in 1976. What's neat about this cabin is when you go inside you can see pieces of old newspaper still clinging to the walls. The trail ends after hiking a total of 5.9 miles from the campground. You end up at Cove Creek Rd (NC 284). You can either hike back to where you started or plan a two-car shuttle in advance. Total Hike Length: 5.9 miles one-way from Cataloochee campground to Cove Creek Rd. Approximate Elevation: Starts at 2900' at Pretty Hollow Gap. The trail peaks at 3800' then descends to 3000' at Hannah Cabin. How to get to the trail: From I-40 take NC exit 20, turn right on Cove Creek Rd. Follow signs 11 miles to Cherokee Campground. Looking for some more historic sites to check out? 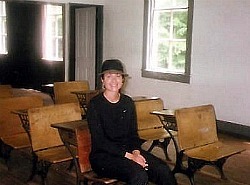 Click here to find out about a hike to historic sites in Cataloochee.